One of worst disasters of the First World War in the country happened at Silvertown in West Ham in the East End of London. This was not down to bombing raids or action by the Germans, but was as the result of a simple accident. The Silvertown Explosion at West Ham. This happened in 1917 when TNT in a munitions factory owned by Brunner-Mond caught fire and exploded. This killed over 70 people and injured over 400. It also caused massive damage to properties in the area around the factory. At the time, London set controls on where certain “noxious” industries could be housed. The city did not want dangerous manufacturing or processing to take place in certain areas. Silvertown was outside of the main central area that banned these factories and processes, and it therefore became a popular manufacturing location in the late 19th and 20th centuries. Local factories were set up to deal with often very dangerous products and their workers lived close to their places of work. 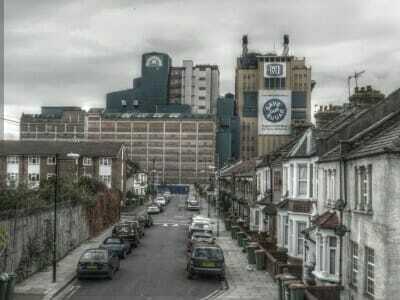 Although the factory at Silvertown had been established since the 1890s, its original purpose was the manufacture of caustic soda and soda crystals. By the time the First World started, the factory was not running at full capacity as it had stopped producing caustic soda. This made it an ideal location, on paper at least, as a munitions plant for the War Office. By the time we were halfway through the war, we had a great shortage of shells and the War Office needed to find plants that could become part of the war effort. Due to its free capacity, the War Office decided to use Silvertown. But, although the factory had the space to work on munitions, it was in the heart of the East End in a very populated area. This made converting it quite dangerous, as was proved when the accident happened. At that point, however, the War Office decided that it was worth the risk. The War Office decided to use Silvertown to purify TNT. Manufacturing TNT is dangerous enough; purifying it is highly dangerous. Nevertheless, by 1915, Silvertown was purifying around nine tonnes of TNT every day. There weren’t any initial problems at Silvertown until 1917. On the 19th January, however, a fire broke out in the factory and, before workers and firefighters could extinguish it, it reached stores of TNT, which then ignited. It is estimated that over 50 tonnes of TNT caused the blast. The factory was completely destroyed and there was widespread damage to other local buildings. These included the local fire station. It is estimated that around 900 local properties were instantly destroyed or damaged so badly that they could not be repaired and needed to be demolished. Over 60,000 local properties sustained some damage with millions of windows shattering in the surrounding areas. An investigation into the blast after it happened did not find a single cause for the explosion, although many people had worried that it had been down to sabotage or a German bomb. The investigation did find that the TNT had not necessarily been stored safely enough. It also finally drew the conclusion that it had not been safe to purify TNT in such as highly populated area, but, by then, it was too late. Although over 70 people died and hundreds were injured as a result of the explosion, things could have been much worse. The blast happened in the early evening so the factory did not have that many workers left in it. People living or working in local buildings were also not at work or at home in any great numbers. Unfortunately, some of those who died were local firemen who had been sent to help deal with the initial fire that caused the explosion. Despite the relatively low numbers of deaths, the Silvertown explosion had a significant effect on the local East End population for a long time afterwards. Thousands of people were left without homes. The rebuilding effort took over 1,000 men and was a long job. They had to build over 400 new homes, repair hundreds of others and re-slate countless more. We can get an idea of how huge the explosion was at Silvertown by looking at how widespread its effects were. The blast was loud enough to be heard in Sandringham in Norfolk and there were reports of people hearing it on the Sussex Coast. The fire itself could be seen from parts of Surrey. All over London, electric lights flickered and windows smashed as the explosion happened. Although so many Londoners and people close to London could not fail to notice that something had happened, the press did not report on the disaster for a full three days. Silvertown, London Area, Where Dreams Come True’, Art Deco Style Humorous Coaster Set (x 4 Coasters), Size 90mm x 90mm. My grandmother Nell Greenwood had a ship’s laundry in Constance Street, Silvertown where she serviced the ships in the docks. My mother was a small baby at the time of the Explosion and was blown out of her cot upstairs. Nell took in many injured people and the more seriously hurt were laid on the ironing boards in the laundry to await treatment. My son, Charlie Connelly, has written a book about the area called ‘Constance Street’. My great, great uncle worked at the plant. He was, as they said at the time, a “bit simple” and he was only employed to sweep floors. On the day of the explosion he came home before his shift finished and all he could say to his mother was “something nasty was happening.” Sort that out! Does anyone know whether there is any kind of listing of those who were injured in the explosion? My great grandfather lived in the area for much of his life and I know that he had lost an eye, but I don’t know when or how. I just wondered if it might have been then – we have no family stories from that part of the family. My late grandfather was Fireman Frederick Charles Sell, who was on duty and attended the fire and was killed in the explosion. I made similar enquiries about 12 years ago and bought two books writeen by the late Howard Bloch and Graham Hill. These were produced by All Points East Publications. In these two publications are copies of the press reoprts of the time, details of the inquests and a full list of all who were killed in the explosion. But I cannot find a list of the injured. There was full reporting by the Stratford Express, which I think became the Newham Recorder. It might be worth making an enquiry of that paper. Good luck. A relative on my mother’s side was, as they said then, “simple” and worked sweeping up at the munitions factory. On the day of the explosion he came home early from work very upset, All he could say to his mother was that something awful was going to happen. An hour later the factory exploded. They do say that the “simple minded” are blessed by God. I came to live in Newham in the late 1970s. I was told that local people believed the story apparently commonly reported at the time that the factory had been sabotaged by the Germans. I understand that the report identifying that the cause of the explosion had been very poor management of explosive materials had been declassified in the 1950’s. I was therefore surprised in 1980 when my elderly neighbour in Plaistow told me about remembering the explosion and insisted that the factory had been destroyed by German sabotage and nothing I said could convince her otherwise. I began to understand the saying that “in war, the first casualty is truth” and how hard it is to change those perceptions. Thank you for your fascinating comment. Knowing what we know today about propaganda during wars I wouldn’t be surprised by that story. I read a good book about WW2 and how the government would hide the exact number and location of bombs dropped so as to not give useful information to the German airforce regarding bomb accuracy. So again many incidents simply “did not happen” or were recorded as an “accident” etc. You may be interested in this entry in a Suffolk Village Headmasters logbook for Feb. 12 1917. “Admitted Elizabeth Morgan (10) James Beckford (6) James Ryder (8). Their last school was Silvertown LCC. These poor dear children told me their school was full of dead and that the explosion was caused by a man dropping a match on some petrol… at the munitions factory. ” On March 5th he recorded that they had returned to London. There were other East End children sent to Suffolk from time to time during the First World War. Some did not return to London until May 1919. In 1917 one mother wrote to the woman who boarded her son Harry Jennings that judging from his letters he seemed to have “greatly improved in his schooling…the schoolmaster your end has accomplished more in the few weeks Harry has been there than LCC did in as many years”. Thank you, this is fascinating. So many different versions as to what caused that fateful explosion, the only truly known fact was how awful it must have been at the time. Regarding the cause of the East End Explosion, those that are convinced of German sabotage must explain why it was that supposedly trained German agents would use such a clumsy method as starting a fire, that would hopefully, but not certainly detonate the 500 tons of TNT that had been loaded onto rail cars in readiness for transporting away? Yes, the fire did its work in destroying both the TNT and the factory plant, but the factory staff might have successfully extinguished the flames, thus thwarting the sabotage attempt. The point I am making is that the final result of a fire could not be anticipated with any degree of certainty. Surely, any trained saboteurs would have demonstrated their training: a few sticks of dynamite and a timer would have done the job; would have done it with almost certainty; and the saboteurs would have been at a safe distance when detonation occurred. And, it was absolutely essential that the explosion occurred when it did: when there was enough TNT at the plant to destroy the plant. Much more plausible? I think so. Here of course we are discussing second causes. Germany might not have lit the fire that led to the explosion that night, but it most definitely was responsible for the death and destruction that resulted, for if Germany had not started the war in the first place, the East End disaster would never had happened: therefore Germany was the first cause. And so, your elderly neighbor was correct in attributing the blame to Germany, but incorrect in the way that blame unfolded. I’d always been led to believe that my Great Aunt Annie Margaret Dabinett died as a result of the Silvertown explosion. Having done a little research I now know that she died the following year back in her home-town Little Petherton in Somerset from acute pulmonary tuberculous, so it’s not really clear. From what I’ve been told she worked in an ammunitions factory in London at the time of her death and that that there was an explosion. What I’d like to find out is if there is some sort of record of the people who were employed at the factory at the time because my aunt isn’t included in any list of the people who lost their lives there and I’m curious as to whether her death had anything to do with her time at the factory or indeed if she ever was at Silvertown. Perhaps your Aunt worked in Woolwich Arsenal. Which is only a stones throw Across the River from Silvertown. Maybe Newham Archives have records, or The London Metropolitan Archives Northampton Place. Thanks Joyce. I will check it out. This has been a poignant week for me as last Thursday, 19th January was a 100 years since the Silvertown Explosion when my grandfather, Fireman Frederick Charles Sell, was killed while on duty. He and his colleagues were on duty at Silvertown Fire Station when they were called out to the fire at Brunner Mond factory. He and Sub Office Vickers were killed while the other fireman were injured. My grandfather left a widow, my grandmother Caroline, with five boys to bring up. Her only daughter, Winifred was killed in the explosion. Their home at Fort Street was destroyed. I am glad there was a ceremony held last Thursday evening at the new Royal Wharf development to mark the occasion. I am pleased that there was a Remembrance Event, for the Silvertown Explosion Victims. I shall try to get to the Exhibition at The E16 Cafe Tarling Road. I have A Memorial Card in Memory of The Disaster. Unfortunately too late to go in The Exhibition. I did pass The info around at our Charlton Society meeting on Saturday.Hoping to get some members to visit. My mother was working at Catford SE6 when it occurred. She said that the Dog was blown from the chair. So sorry to hear that your Grandparents were involved. Thank you for your response to the message I placed concerning the Silvertown Explosion and the memorial gathering held last week at the memorial. As can be imagined the effects of the Explosion and the death of my grandfather while on duty carried on for the rest of the family’s life. All the survivors were scarred mentally for the rest of their days. My grandmother, Fireman Sell’s widow, lived to the age of 98 but never mentioned to me as a child anything about what had happened. The five sons, one of whom was my father, were all psychologically damaged but of course there was no treatment available in those days. It was as though they decided to deal with the trauma by never talking about it at least not to me or my cousin. I only found out the full details a few years ago when finding a box containing photographs of the West Ham Corporation funeral for the two dead firemen (Sub Officer Vickers and my grandfather),my grandfather’s only daughter Winifred and a baby girl, the daughter of Fireman Betts. I also found the King’s Police medal awarded to my grandfather posthumously and a West Ham Corporation medal. I understand these were awarded to all the firemen involved. In 2005 I took these items to Silvertown Fire Station for them to keep on display. I do not know what happened to them when the Silvertown Fire Station was closed down in 2015. I hope that you read this message. My name is Robin Mary Hargadon. I am the great grand-daughter of Henry Vickers, who served and died with your grandfather, Frederick, on January 19, 1917. I travelled to London last week to mark the centenary, along with two brothers, a sister in law and adult niece and nephew. We were extremely close to my grandmother, Hilda (Vickers) Tickell, who was just under 20 years old at the time of the explosion. She returned home from work that evening, and a friend of her father’s was visiting. He pulled her under the table when they heard the fire alarm and she always told us that this saved her life. Unfortunately, her father was killed and her house was destroyed. She moved to Plymouth with her mother, Annie, and eventually came back to Essex. She eventually had my mother, Aileen, who was a WREN during WWII; my mother met my father, a member of the Canadian Navy, and ultimately moved to Canada. My grandmother was widowed in 1936 and joined her daughter in Canada, just before the birth of my eldest brother, in 1949. Hence her grandchildren are Canadian! My grandmother was a very stoic woman; she spoke of the explosion at times, and it was clear that losing her father was heart breaking. She never liked to be left alone in the evening and could not stand the sound of thunder – these effects might also have been related to living through the Blitz in London. She lost a second house during WWII. Her home was completely destroyed when the Brunner Mond factory exploded. In any case, I wish we could have connected when I was in London. We visited the grave site of our grandfathers at the West Ham cemetery and left cards and flowers. Also, we attended the event in Canning Town and I also went to the event, towards the end, at the Brunner Mond site. The Borough of Newham will be displaying the poster boards they prepared for the centenary, I think at local libraries, so perhaps you can find them. The mayor’s office should be able to let you know where they are right now. Finally, I would be very interested in seeing some of the pictures you have from the funeral of your grandfather and my great grandfather. They were buried together, along with your aunt and the Betts baby, and I understand that the funeral was very big (and long according to my grandmother’s account – four hours). One last thing – consider contacting the Essex Fire Brigade museum in Grays – they might be able to tell you where your grandfather’s medals are right now. We visited them last week. On another note, it’s hard to appreciate the impact of the trauma of the Silvertown Explosion on the hundreds of people impacted by it. At the same time, the resilience of the community was something quite special it seems. I work as a Psychologist with focus on first line responders and military members/veterans impacted by trauma experienced in the context of their work. Perhaps this is why I now have an even greater sense of admiration for my grandmother and her ability to cope with the devastation of the Silvertown Explosion – including the loss of her father and home at just under 20 years of age – than I did when growing up. I believe that the shared funeral of our relatives occurred on Feb. 3, 1917. Since writing last week, I have received a picture from the funeral procession; so many of their firefighter colleagues and people from the community came out that day to pay their respects. It must have been a comfort to the families. Thank you for your response re Silvertown Explosion. I had copies of photographs taken of the Civic Funeral organised by West Ham Corporation for the dead firemen. They included pictures of the fire engines used with the coffins on the rear tender. There were the coffins of the two dead firemen, one with the remains of my grandfather’s daughter, Winifred and a particularly poignant picture of the small coffin of the 4 month old baby. These were all carried on the fire engines. The baby was the daughter of Fireman Betts. The funeral procession was led by a band from the Metropolitan Police. All these photographs I left with the Silvertown Fire Station along with my late grandfather’s medals- the King’s Police Medal and a commemorative medal awarded posthumously by West Ham Corporation. All these items together with a picture of my late grandfather wearing his West Ham Fire Brigade uniform and brass helmet I had framed and mounted in a collage which I handed over to Silvertown Fire Station in 2005. Thank you for your suggestion re a contact. I wrote early last year to London Fire Brigade museum to see what had happened to them after I heard Silvertown Fire Station had been closed in 2015. I didn’t receive a reply. My Great Grandfather, William Lambert, worked at the Brunner Mond factory and was killed in the explosion. He was 34 years old and the father of 5 children aged between 2 and 12. My Mum (his Granddaughter) never knew him and we know very little about him, no photos etc. but she remembers being told he was about to start his shift (or maybe about to leave to finish his shift) when the explosion occurred. All we have of him is his belt, which was found at what is now the Canning town flyover, some fair distance away. I don’t think that there was any financial support for bereaved dependents; his wife (my Great Grandmother) took in washing in exchange for bowls of soup to feed herself and her children, and died of “exhaustion” only six years later, leaving her eldest daughter (my Great Aunt) to raise her 4 younger siblings. We read about the Commemoration Service in the Newham News Magazine, which was quite a brief mention, and my Mum, who is now 81 years old, wanted to attend to mark such an anniversary. We made our way to the area where the monument has always stood, but we had trouble finding it as we didn’t know it had been moved and after much driving around we found it’s new location quite by chance, only to be informed by some sort of security official we couldn’t park our car close by and to move it back onto the main road (double yellow lines)! Not exactly a warm welcome but didn’t detract from the occasion for us. Thank you very much for sharing your story and link! I have a Memorial Card, in Memory of the victims of The Silvertown Explosion. Our Local Heritage Centre have suggested that it goes to an Appropiate Museum . Any ideas please. As it will be The Centenary next year. Hi Joyce, my organization Eastside Community Heritage are currently running a project on the Silvertown Explosion and are looking for people with any information or family histories to interview in preparation for a talk and exhibition on the 19th January 2017 to mark the 100 year anniversary of the explosion. We’d love for you to get in touch with us and share any ifnoramtion you have on Silvertown and the Silvertown explosion. My email address is [email protected] and you can phone our office on 02085533116. I am enjoying reading and learning from your site. My grandmother , her sister my great aunt and their family considered the Silvertown explosion as one of the defining moments of their lives, along with a London Flood , WW1 and WW2. The whole family , brothers and sisters worked at the sugar refinery . My Great Grandfather had been a steeplejack involved in the creation of the great chimney – family legend says he put the top brick on it! When the explosion happened one of my Nan’s twin baby brothers was in the bath tub in front of the fire and died instantly- whether from shock or suffocation from the soot and dust rushing down the chimney as Nan suggested , perhaps both. Child deaths were common then , but this one particularly marked the family as you can imagine. They were temporarily housed in church halls following both the explosion and the flood. What a terrible happening the explosion was for the locals. My Nan would mention it from time to time until she passed away in the mid 1990s. Thank you for the great family history. I became fascinated by the Silvertown story when I read as a child a 1931 book that my grandfather had – “Fifty Great Disasters and Tragedies That Shocked the World”. Living not that far away in Ilford I was fascinated by the tragedy. I will get in touch with Museum of London . And Newham Archives. It might be useful for a local Exhibition. Thought you may be interested. Have you read The Book, “The Sugar Girls” told by some of The Tate & Lyle Girls who are still around. It is excellent. I am on my second time around it. It is so like Factory Life in those Days.I got my copy at Watersons Book Shop. I work for an organisation called Eastside Community Heritage and we are currently collecting information for our upcoming porject on the Silvertown Explosion which will be a talk and exhibition on the 19th January 2017 to mark the 100 year anniversary of the explosion. We would really love if you could contact us to talk about your families history and connection to Silvertown and the explosion. My email address is [email protected] and my office number is 02085533116. Perhaps you can help, In the Everett Family there was a waterman called George Sidney Everett who I was told as a small boy help in the rescue of some people from the Blast,old family history perhaps you may or seen some literature if you can help, The Everett were related to my Grandmother George was her father all came from woolwich south side Thanks.